We are not asking for a lot. We are asking to be treated with respect, have guaranteed hours, and to be paid a decent living wage of £10 that we can afford to live on. It’s all very reasonable when you actually think about it. These are the words of Lewis Baker, one of the McDonald’s workers striking today. Lewis is completely right – each of the requests being made as part of these strikes is completely reasonable. Jobs are supposed to offer us some financial security – enough to live on and get by. But that increasingly isn’t the case. Despite employment being at a record high, work is failing to offer a guaranteed route out of poverty. In fact, a majority of people in poverty are in working households. Some workers are working full time and are still living in poverty. That’s the harsh reality of it. Shen Batmaz, one of the strikers at the Crayford branch of McDonald’s, has highlighted the impact of this. In an interview with her local newspaper, she explained that one of her colleagues has been left homeless due to poor pay and conditions. This isn’t a unique experience. A number of insecure workers recently told us about being unable to pay the rent – some having to move back in with their parents. In-work poverty is unsurprising given that real wages are lower now than they were back in 2008. Money just isn’t going as far as it once did, and people are struggling. This isn’t set to get better. For four months now, real wages have been shrinking. And the OECD has forecast that UK real wages will fall by 1.1% in 2018. This is the joint worst across the OECD countries. In the face of this pay squeeze, workers requesting a higher rate of pay is, as Lewis said, completely reasonable. This is especially true given that their employer makes billions each year, and is experiencing record share prices. At the TUC we believe the National Minimum Wage should reach £10 an hour as quickly as possible. The Low Pay Commission is starting to take evidence on the rates for next year in September. We hope they’ll be listening to workers like those in McDonald’s. It’s not just the pay, but also the contracts. Those on strike were promised an end to zero-hours contracts. This promise is yet to be met. It’s happened to a friend of mine who went on holiday who came back to just one shift a week instead of five … No explanation was given, because they don’t have to give one. This is a typical experience for those on zero-hours contracts. We’ve heard from many in insecure work about being given little notice of their shifts. Some even turn up for work just to be sent home without pay. They have no idea when they’ll be working, or even how long for. This means pay unpredictably fluctuates, and budgeting becomes pretty much impossible. Treating staff like this is indicative of a power dynamic that favours the employer. Staff are reliant on their bosses for shifts, and doing something that displeases a boss can lead to a drop in hours. A drop in hours means even less pay. This same power dynamic allows some bosses to get away with hostile behaviour. We recently heard from those in insecure work who had been threatened and harassed by bosses just for turning down a shift, or taking sick leave. Given these pay and conditions, it makes sense that one of the requests of the strikers is the right to unionise. 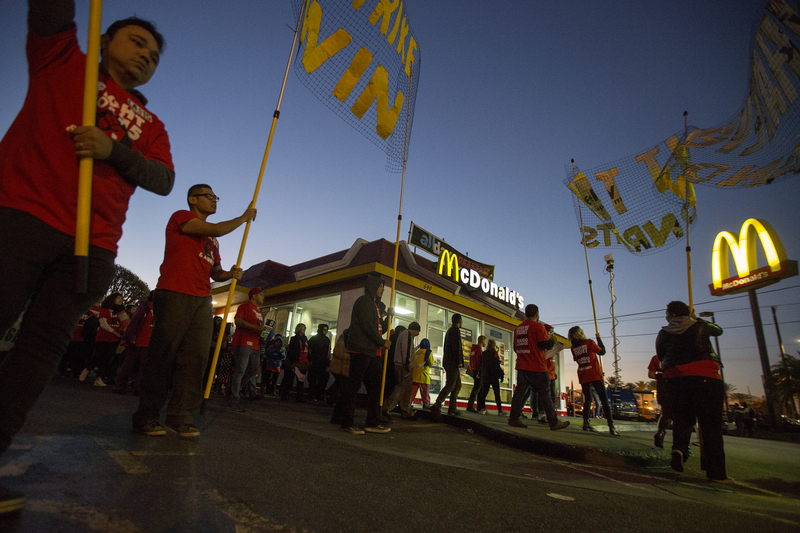 The fast food industry isn’t known for a history of strikes. As many have noted, this is the first time ever that McDonald’s workers in Britain have taken strike action. The symbolism here is therefore important. These workers have suffered silently for too long. They’ve fought hard, and risked a lot, to have their voice heard. Other workers facing the same problems and pressures deserve to be able to unionise and make their voices heard too.